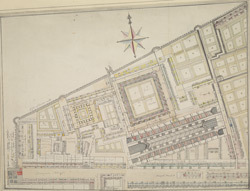 This is an 18th-century copy of Ralph Treswell's 1610 survey of the Precinct of Grey Friars. Although better known as painter in his lifetime, Ralph Treswell was also a mapmaker and one of the first land surveyors of the modern era. The plan features compass star at top centre. The London Wall, Christ Church and Cloisters, private tenements, and the market on Newgate Street are all shown pictorially.